This NEW custom built log cabin home is nestled on the backside of Okemo Mountain. 45 min - Mount Snow. The cabin is located on 10 acres of land on Vermont's Vast Trail. Perfect for families and/or couples looking to get away and enjoy Vermont in a traditional log cabin. Minutes from premier golf courses, the Appalachian Trail, Star & Echo lakes and the Castle Spa in Ludlow - Snowshoe / Cross-Country too. Enjoy skiing, snowmobiling, snowboarding, hiking, mountain climbing, walking, antiquing, shopping, fishing, golfing, hunting, canoeing, kayaking or just relaxing. Two first floor bedrooms (sleep 2 each), upstairs loft with 2 twin beds and a full bed (sleeps 4 kids or 2 adults & 2 kids), full kitchen with refrigerator, stove, microwave, programmable coffee maker, granite counter tops, full bath, deck with seating, living room and dining area with the ambiance of a wood burning stove. Amenities : TV, VCR/DVD, radio, alarm clocks, books, movies & games. Skiers/Snowboarders/Hikers/Bikers/Golfers: This NEW custom built log cabin home is nestled on the backside of Okemo Mountain. 5 minutes to Okemo and Jackson Gore. 30 minutes to Killington, Bear Creek, Pico & Magic Mountains. 45 minutes to Mount Snow. The cabin is located on 10 acres of land on Vermont's Vast Trail. Perfect for families and/or couples looking to get away and enjoy Vermont in a traditional log cabin. Minutes from premier golf courses, the Appalachian Trail, Star & Echo lakes and the Castle Spa in Ludlow. Enjoy skiing, snowmobiling, snowboarding, hiking, mountain climbing, walking, antiquing, shopping, fishing, golfing, hunting, canoeing, kayaking or just relaxing. My husband built our solice and hand crafted every nook and cranny. Just one step into our home and you will see all your cares and concerns vanish. We hope you enjoy our home as much as we do. Two first floor bedrooms (sleep 2 each with a total of 4), upstairs loft with 2 twin beds and a full bed (sleeps 4), full kitchen with refrigerator, stove, microwave, programmable coffee maker, granite counter tops, full bath, deck with grill, living room and dining area with the ambiance of a wood burning stove. Amenities include Direct TV, VCR/DVD, radio, alarm clocks, books, movies, games, puzzles, some toys, telephone, local maps & dining guide. Sheets, pillows, blankets, quilts, and towels provided. Families Welcome. NO Pets. We really enjoyed our stay. The owner, Janice, was very nice and responding quicky with any questions we had. The cabin was cozy and very clean. Janice emailed us a list of restaurants and things to do and even though we’ve been to Okemo many times we found a new restaurant to try because of her recommendation and we loved it. There were plenty of games for our daughter and nephew. I would highly recommend this cabin and would stay there again. Very quick drive to Jackson Gore and the Okemo Clock Tower. Having used VRBO before I have to say that Janice was by far the best owner we have dealt with in regards to communication and response time with any questions we had! Thank you Kara we were glad to have you and your family!!! Beautiful, relaxing family cabin! Close to skiing! Relax, ski and snowmobile with family!! Far enough away for peace of mind, and true relaxation but close for skiing convenience! You are just as close to all the restaurants downtown. Very clean and such a comfortable layout. You WON'T miss staying on the mountain. A beautiful setting and snow mobile trails right there! We left feeling refreshed! I will definitely be booking again with my family. I would definitely recommend this cabin to my family and friends. Clean and we'll equipped. Beautiful. My children loved it so much they did not want to leave! You and your family are true welcomed guests. We appreciate the care you took of our Sweet Pea Cabin and are so pleased that you enjoyed your stay. 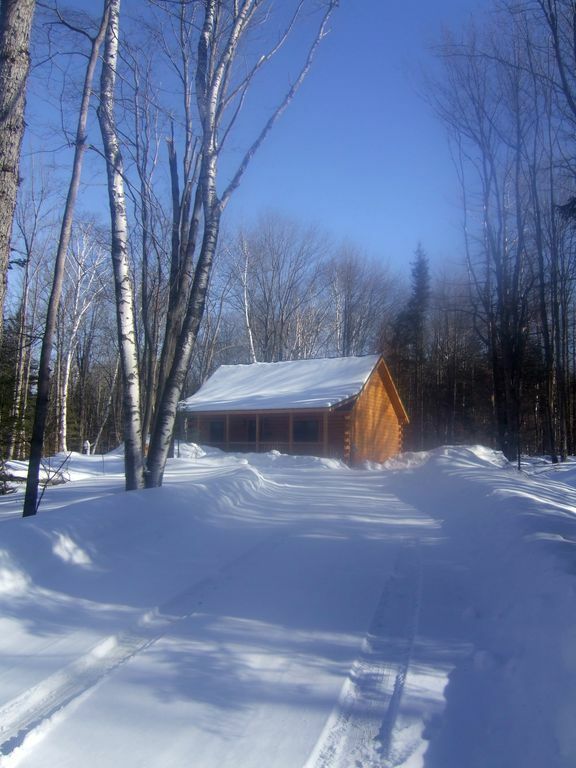 The cabin is located on 10 acres of land on Vermont's Vast Trail.